Pop art was the band's first album and it reached number four in the UK album charts. Four singles were released from the album, but only two made the top 30 - "Revolution baby" made it to number 30, but only "I want your love" got into the top ten, reaching number 5 in the charts. The Deluxe edition is a 2CD release, with the first disc containing the original album. It sounds great, and is just as listenable now as it was when it first came out. Despite only having one hit single (I want your love), it's got some great songs - alongside "I want your love", "Trash city", "Andy Warhol's dead", and "Psychosonic Cindy" are some of the best. Also on the first disc is the first of the bonus material - four songs from the Andy Kershaw session. The second disc contains the bulk of the bonus material though - 17 tracks of it. There are extended versions and remixes of tracks from the album along with B sides from the singles that were taken from the album. OK I might be slightly biased as I'm a big fan of the original album, but I think this is an excellent release. 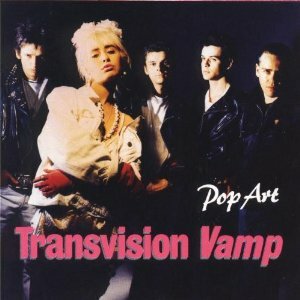 Fans of the album are going to love this new version with all the bonus material - there's just so much new stuff here that it's a purchase that most Transvision Vamp fans are going to want to make. Of the two deluxe editions I think "Velveteen" has the stronger bonus tracks, but the ones here are definitely worth listening to.